The Smart Dash Stand has been developed to fasten electronic devices such as iPhone, iPod, BlackBerry Smartphones, GPS, PDA, Cell Phone and MP3 devices. The design is simple, effective, easy to use and shock absorbent. 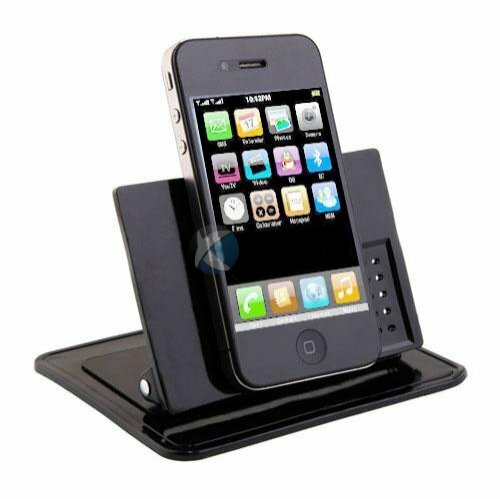 Conveniently to place your Cell Phone, GPS, iPhone or MP3 Player without any complicated step. Metal mount with durable silicone pads. Convenient, reliable and easy to use. The product meets ROHS standards and does not use magnets, can withstand daily sun light. Washable & Movable - If pad becomes dirty, clean the pad with soap and water, and re-apply. Anti-Glare and Flexible design - suited for curved surfaces. High quality Anti-Slip rubber - Holds Cell Phones, GPS, MP3 Players, Coins, Keys, & Pens. Can be used in Car, Office, Home. XENDA(TM) Car Dash Phone Mount. It utilizes a special adhesive rubber to fasten electronic devices securely. Mounting pedestal adjusts quickly and easily. Installs in second without tools. Washable! Clean it by water.